Hello everyone, welcome. It feels like my site has been swamped with Kickstarter unboxings and reviews of late, which is all great but I think it is about time I wrote about another games night. Aside from anything else, it is less exhausting than editing unboxing and how to play videos! 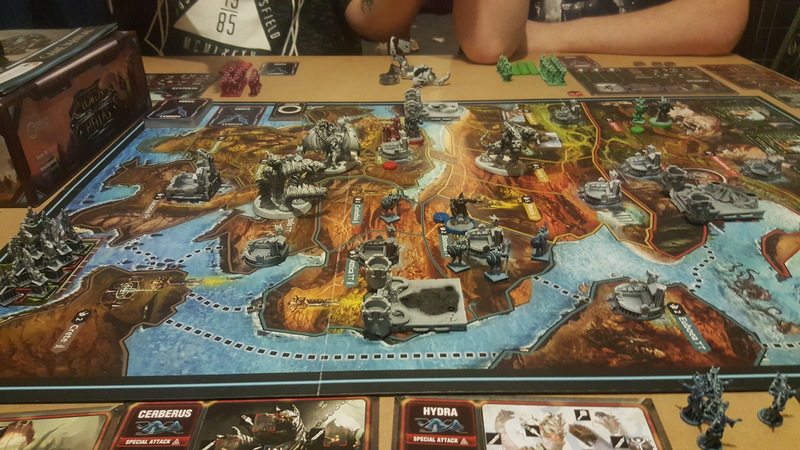 Today’s post is about my first play of Lords of Hellas. If you are unfamiliar with the game, you can check out my original article on the previous link, which has an unboxing, full how to play video and a lot of photos. There were three players, Stuart, Joe and myself. This meant there was a fair amount of room to maneuver and setup each of the individual factions that we chose. Being a good sport, I chose last. Stuart took Perseus, Joe took Heracles and I took Achilles as our faction leaders. Truthfully I was hoping to play Perseus due to a cool ability he has, but Achilles was an acceptable substitute. Helen would also have been acceptable. I had taken the time to re organise the rules into a more logical format as the rules as written were a wee bit ambiguous. As it transpires, the obvious interpretation seemed to be the one that prevailed where there was ambiguity, but for someone like me that caused me many hours of mild frustration as I tried to figure things out. I did in the end and that became my how to play video. So, I explained all the rules. Fun fact, I can explain every rule in the game but because there are so many folk are going to forget many of them in the first and maybe even second play. Accept that and move on. I stationed my starting miniatures, Achilles and 2 Hoplites in Boeotia, adjacent to Attica. I wanted to start in Attica as that is where the Athena monument is, but there was no way to control the territory. Yet. So I started adjacent, in an area with a city. Perseus started in Northern Greece near the monument of Zeus, whilst Heracles took the south near Hermes. As I deployed last I got to go first. First of all I seized my starting territory with the city as I had sufficient Hoplites to do it, and then I began marching them into neighbouring Corinthia to grab the shrine. I could only move one Hoplite Unit at this point so I couldn’t seize Corinthia this turn. I didn’t bother moving my hero, nor could I do prayer or use an artifact. So, with my regular actions complete I needed to choose a special action. I chose reinforce and received 2 new Hoplites at Boeotia. And that was my first turn. I should mention we started with Hyrda, Chimera and Cereberus on the board at the start but that was fine. Truthfully I didn’t pay too much attention at the start of the game to either of my opponents (this proved to be a fatal flaw). They moved around, captured cities and shrines and recruited. On my second turn I marched another Hoplite to Corinthia seizing it. As my special action I built a temple on the Shrine, which granted me a Priest I could use next turn. Turn three, I sent the priest to Athena to Pray to increase Achilles leadership. Leadership rating allows you to move larger forces of Hoplites in any given turn so I decided Leadership would help me move larger armies. With this in mind I moved 2 hoplites form Boeotia into Attica, and as a special action used prepare to recruit 2 Hoplites to my Hero. I was nearly in control of the statue. I think I could try and do a blow by blow of the game, but that would get tedious. So I will share some highlights. I was able to build a small force of Hoplites in Attica, attached to my hero, which allowed me to seize Athena’s monument. I was able to capture other shrines and build temples giving me a steady supply of Priests. Most of the time I prayed to Athena, but Hermes got a few prayers too. I prayed to Athena most frequently as I was building her statue, and at higher levels, every time you pray to her you gain Hoplite reinforcements. I ran out of reinforcements this way. And with my leadership I was able to move lots of them. I was able to advance quite far north as Stuart/Perseus had me worried as he was well entrenched into the Statue of Zeus. I didn’t want him completing it before I completed Athena. Fortunately, slaying the Chimera (even in a cheeky way) allowed me to Usurp the Statue of Zeus and then I moved an Army in. I was able to complete two of the quests in the game. Stuart and Joe managed to drop Medusa and Hydra into my largest troop formation which caused a number of my troops to be munched/turned to stone. I completed the Statue of Athena, and was 1 turn away from winning when Joe stole victory from me by territory control! Lords of Hellas is a hard game to teach. There were a few cranky moments when I did something that other players didn’t know was possible. There is a lot to take in so this is going to happen. Accept that and you might not have cranky moments. Lords of Hellas is a lot of fun! I didn’t care that I lost, at all. Planning my strategy to grab Shrines and build up Athena whilst also building an army was a lot of fun, as was the quest mechanic. I didn’t engage in any hunt during the game, but Stuart did twice (and won the second hunt). He enjoyed that. Joe was able to win simply through territory control because Stuart and I were too busy with each other. Each Hero has different bonuses and this means they have different starting play styles. Each God in the game has different benefits depending on your strategy. There are four ways to win the game, and all of them are fun. Sounds like a good time! It is a lot to take in at first, but after a few games it settles down. Sounds like you had a good time over all though! MAYBE VICTORY ALWAYS FIND YOU!